The Azores islands were discovered or recognized in 1427 by Portuguese navigators, the Azores islands were populated in the 15th century by pioneers from Portugal although small groups of Flemings settled in some of the islands. During the 16th and 17th centuries the Azores archipelago was one of the centers of trade between Europe America and India, and its ports sheltered and serviced galleons loaded with treasures. The archipelago developed during the 19th and 20th centuries with the introductions of new crops, the developing of industries, and progress made with stock-breeding and fisheries. The average temperature in Azores is 18°C (64°F). Statistically the driest month is July and the wettest November. Average annual mean relative humidity is 76%. It ranges from 73% in August to 80% in December and January. Frost is non-existent in Azores. The ocean water temperature in Azores range from 17°C (63°F) in the winter to 25°C (77° F) in the summer. The average annual rainfall increases from east to west, with annual precipitation of 958 mm (37.7 in) or 80 mm (3.1 in) per month. The Azores high, an area of high atmospheric pressure, is named after the islands. Light clothes, with one or two sweater or jacket pieces for the cooler days or nights, are enough all year round. In the winter slightly warmer clothing may be necessary. It is better to bring along a light raincoat, however, as there are sometimes showers followed at once by sunshine. "The days of the four seasons" as the Azoreans affectionately say are more prevalent in the months from October to April. The mild Azorean climate, beautiful scenery and quiet golf courses make the archipelago an ideal year round golfing destination. The breathtaking landscape is the perfect setting for unforgettable rounds of golf in an environment of pure nature. The Azores has the perfect weather to play golf all year around, due to the presence of the Golf Stream. The Azores consist of nine islands and the main island of Sao Miguel is the largest. 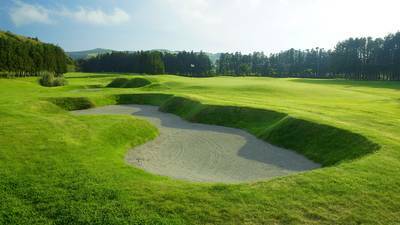 Overall, there are three golf courses in the Azores - two on Sao Miguel and one on the island of Terceira, 167 km away and a thirty minute flight from Sao Miguel. Most choose Sao Miguel since there are two courses here and it is the island with direct international connections. However, you should know that there are daily flights to all of the other islands in the group. 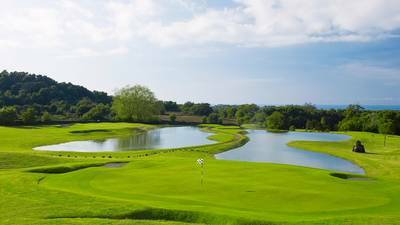 All three courses are situated in magnificent natural scenery and you are struck by the greenery, the floral display and the picturesque backdrop. Book your golf tee times for Azores with Justteetimes.com, your one stop source for online golf tee times and green fees anywhere.